On the 28th I ran the Bumble Bee 5k at the Big Balloon Parade. It is the race right before the Holiday Bowl Parade in San Diego, CA. We got to start our run in front of the grandstands, run the entire parade route in front of thousands of supportive on lookers. The race was very congested in the beginning. It took about 25 seconds to get to the start and then we walked for a bit before it thinned out and I could take off. My family was watching around the 3/4 mile mark and got to take my picture. I did have to circle around so that my wife could take it adding 20 seconds or so to my time, but it was worth it. We raced downtown San Diego passed the Padres Baseball stadium. Looped around the convention stadium and ran along the bay. Thru Seaport Village to the finish. From start to finish I timed myself at 33:16, another PR for me. The official time was higher, but in my defense, several people passed me in the shoot and they collected my bib tag about 100 yards away from the finish. It could not be a very accurate way to get a finish time. Vacation: We had a great time. My daughter got to see the set for Gilmore Girls. She's a fanatic. The whole Warner Brothers tour was great. We got to go to an aquirium, museum and the San Diego Zoo too. I didn't get to run as much as I'd like, but oh well. Weekly running: On Christmas day I ran 3.88 miles in 47:10. On Wednesday I ran on the treadmill at the Holiday Inn, San Diego. 1.77 miles in 23:05 and then I ran another 10 minutes, but didn't keep any records. Stefano, The Black Knight from Italy tagged me. He has a great blog you should check it out, if you haven't already. Now I feel like I belong. I guess this is like a new age chain letter. Here's my answers. I guess I can't pass this along, since it's Christmas related. Consider my not tagging you as another Christmas present. 2. Does Santa wrap presents or just sit them under the tree? Wrapped, and put out on christmas eve. My wife still thinks our teenage kids have no clue. 3. Colored lights on tree/house or white? Colored lights. But, I do love the all white look too. 4. Do you hang mistletoe? No, but that doesn’t stop me. 6. What is your favorite holiday dish (excluding dessert)? Turkey and dressing. 7. Favorite holiday memory as a child? Christmas at Grandma’s. 8. When and how did you learn the truth about Santa? I learned the spirit of santa can be in everyone at a very early age. 9. Do you open a gift on Christmas Eve? Yes, as a kid. Now we wait, per wife’s orders. 10. How do you decorate your Christmas tree? Fake tree, tangled lights, too many ornaments and family. We have a good time. 11. Snow! Love it or dread it? No snow in this part of Arizona. But, I do get a sick joy out of watching blizzards back east. 13. Do you remember your favorite gift? No, but I remember the gift givers. 14. What's the most important thing about the holidays for you? Family. 17. What tops your tree? An angel. 18. Which do you prefer, giving or receiving? Shhh. I do like to receive. I don’t really like shopping, but when I find a great gift it’s cool to give it. 19. What is your favorite Christmas song? Anything from my dad’s era. Bing Crosby is the best. 20. Candy canes? Grandma’s Mince Meat Cookies. See post below. 21. Favorite Christmas movie? It’s a Wonderful Life. 22. What do you leave for Santa? I think we should leave Santa a Garmin 305, lots of gatorade mix and entry fees to about a dozen different races. But, hey if you just want to leave cookies and milk that’s ok.
Running: Christmas day run of 3.88 miles in 47.10. I kind of felt sluggish, but I was happy with a 12.08 pace. My Christmas Gift to you. Then add the mince meat. Put a small amount on the cookie sheet about an inch a part. Flatten real thin. Bake 8-10 minutes. When she says flatten real thin, she means it. Dollar bill thin. We use the bottom of a drinking glass dipped in dry flour to smash our cookies. We then will add nuts or candy sprinkles to the top of the cookie before baking. We miss grandma Monahan, but remember her every Christmas with her mince meat cookies. We also, cherish every meal we eat on her dining room table. Christmas is extra special when you have great memories of Christmas past, thank you grandma. I got to run in Kiwanis Park today. It's a beautiful park with a lake, softball fields, picnic areas and other things you'd see in a park. Today, my daughter had another party to attend. This time a birthday party at Kiwanis. The beauty of Arizona is that you can have picnics and outdoor parties during the winter months. So, I dropped her off and went for a run in the park. One hour and 46 minutes later I was done with a 8+ mile workout and she was ready for her next party. Yes, she had another party to go to at a friends house. Not many runners out on a beautiful Saturday afternoon. I only passed one other group. Two women with jogging strollers running around the lake. There was a party setting up for a wedding that looks like it will take place tonight. Hopefully, it won't be too cold. Arizonians get cold easily. I'm up to 77 miles for the month with one week to go. Looks like I might have my first 100 mile month. The day after Christmas we will be going to California. First, we'll go to Burbank and take a tour of Warner Brothers Studios. My daughter is a big Gilmore Girls fan and she's sooooo excited about going to see the set. Then we'll drive down the coast to San Diego to go to the world famous zoo. In between I will hopefully run in the Bumble Bee 5k. It's cool cause the race starts right before there Big Balloon Parade and you get to run past 100,000 people. I'll have to get my mileage done in California if I want to get over the 100 mile mark. Just wanted to say it's my wife's birthday. And she doesn't look a day over 29. Just finished a 1 hour run. Got in 5.11 miles at under a 12 minute pace. So, my daughter got us some free premiere tickets to see Dreamgirls at the Harkins Theatre in Scottsdales mall. It's a showing one day before the official release. We get there early because they said they gave out extra tickets and they expected it to be filled to capacity. We waited in line and only about 50 people came. The theater was practically empty. Before the movie they told us if we had an kind of recording devices, including camera phones we were to take them to our car, because we would not be admitted with them. They had a guy check purses at the door and throughout the entire movie two people used night vision binoculars (or something) to check each row. In the middle of the movie they escorted one young man out. I, literally felt like I was in an occupied country and if I even sneezed the secret police would take me away and I'd never see my family again. It was very strange. But, the movie was great. Jennifer Hudson, from American Idol stole the show and Eddie Murphy was super too. After running a PB 12 miles on Saturday, do I take the day off on Sunday or do a slow recovery run? I decided to do a recovery run. I had to take my daughter to a christmas party a bit aways from our home. So, instead of making two trips, I ran while she partied. I ran in Cooper Commons, a nice community of homes built mostly 4-5 years ago. My plan was to run slow and walk often. Which I did. I still had a pace of 13:04 and ran 2.61 miles. And my legs feel much better. 1) Ohio. As a youth. I probably did my first mile in high school on the Aiken HS track in Cincinnati. I, also ran my fathers treadmill earlier this year. 2) Indiana. In college I would run to the high school and back to my dorm. I went to Earlham College in Richmond, Indiana. It was between 1-2 miles. Not real consistent. This year I ran in West Lafayette and on the campus of Purdue University. I even did the stairs at their football stadium. 3) Arizona. I've run a lot this year. Not, many states, but it's a beginning. I will be running in California after Christmas and I will probably run the Vegas strip sometime in 2007. So, I'm looking for a runner's blog in Japan. I'm half Japanese, so I'm always into anything from the land of the rising sun. Which is funny, because I live in the 'Valley of the (incredibly hot) Sun'. Marathon Day In Japan, please note that any long run in Japan is called a marathon. It looks like all kids do an appropriate distance for their age. We should do this in the states. Folding a Shirt In Japan, I learned this and now my wife expects me to fold all our shirts. If anyone knows of a runner's blog from Japan, please let me know. I'd like to follow it. Today was a scheduled long run along the Arizona Canal with Team In Training. 10-12 miles for the half marathoners. I got there a couple minutes after 6:30 am. The team was already stretching, so I signed in and started doing my leg swings. I really like leg swings, they really loosen up my hips and get me ready to run. But, I need a tree to keep from falling over. Someone said to hold your opposite ear and you can keep your balance. I need a tree. As soon as we started to head on over to the canal, I realized I didn't have my gatorade. So my first 1/2 mile was running to the car and then to the canal. Last on the canal I started passing the walkers, dog walkers and other hearty soles that were out this early. There's 2-3 different marathon training groups that train here, so the canal was quite active. This time we headed east, a new loop for me. I planned on running to 56th street which would put me a bit over 6 miles out. The ground was terrific. West on the canal is a gravel road in places with some concrete and asphalt paths. The gravel part has some larger rocks. Going east the path was smooth crushed stone that was very powdery. I passed by the Arizona Biltmore, one of our luxury resorts. I started running with my sweat shirt on. Quickly, I decided the weather was too nice and I left it at a water station. The sun was coming up, so for part of the run I had to look into the sun. On the way back, no sun and it was wonderful. My legs started aching and haven't let up yet (6.5 hours later), but I'm sure I'll feel fine tomorrow and hopefully will get in a short run. I finished the 12 miles in 2:34;10. I believe this is the longest I've run by about 23 minutes and the furthest by 2 miles. I hope to do another 10+ run before the RnR Half Marathon in January. The first half of last year I never, ever thought about going for a run. Not a jog, not anything faster than a leisurely hike and not any distance further than a mile or two. Then I went for a short one mile run in June. It was around 100 degrees out, but I went after sunset. Since that first run I’ve run over 300 miles and have competed in 4 races. The longest of these races was a 10 kilometer or 6.2 miles on Thanksgiving Day morning. I have plans to run a 5k race in San Diego on the 28th of this month and then to run a half marathon (13.1 miles) in January. Wednesday – 5 miles in 1:00:22 at a 12:05 pace. Thursday – 5 miles in 1:02:05 at a 12:20 pace. 12/28 "Bumble Bee-SD" 5k ???? It's the only night I watch tv with a plan. How I Meet Your Mother, The Class, Two and a Half Men, The New Adventures of Old Christine and Studio 60. Just don't tell anyone that I'm not watching Monday Night Football. Today's Running: I ran in the neighborhood for 1 hour, 12 minutes and 43 seconds. I covered 6.23 miles and my pace was 11:40. I only walked three times. Just think in June my first venture out running was about 6-8 houses. I finished walking around the block for almost an entire mile. Fellow Bloggers: I get a lot of inspiration from my fellow bloggers. Almost every other day I click on my favorites which you can too. Look down the right side of my blog and you'll see my favorites by location. Lately, I've been really motivated by the Texas gang. These runners in the Houston area are special. If you're into running, check them out. and I'm starting in corral 19. Which I'm sure is near the back, but that's ok. There's no rush. Looks like instead of going thru downtown Tempe, the half marathon route will go along the Rio Salado (Salt River) Parkway just north of Sun Devil Stadium. I've shown you some of the photos from the half marathon course. Now you can see them all by visiting my RNR Half Marathon Photo Album. My training is going well. The slight detour for my vasectomy hasn't slown me down too much. Yesterday I ran 5 miles with only three walk breaks and I did 8 miles last Thursday. I'd like to do a 10-12 mile run sometime within the next week and do 30 miles for the week. Amy and the kids are going to see me somewhere in the middle of the race and at the finish. I need to start thinking about strategy for race day. I think I can predict when I'll arrive at each mile (give or take 20 minutes), so I think I'll have them wait for me at the Chinese Cultural Center near mile 8 (10:15 am). What I'm not sure about is how many minutes will it take for corral 19 to get to the start line? There will be over 19,000 runners in front of me. I plan on carrying my phone, some gu and maybe a camera. I'll also have my Ipod to keep track of my pace, not to listen to music. There will be a dozen or more bands lining the course and just as many cheer squads. I should be suffiently entertained. Any experienced marathoners that have any words of wisdom for me, please leave a comment. My next race is going to be in San Diego. It's the Bumble Bee 5k at the Big Bay Balloon Parade. This is a really neat 5k run in downtown San Diego the day of the Holiday Bowl. Right before the balloon parade, the runners will take off in front of 100,000 spectators. We'll run south with views of the Pacific Ocean and downtown. Then we'll loop back north and finish near the parade route. I figure my family can watch the parade and see me at the finish line. Thursday run: My plan was to do a late morning run of 10 miles. Work kept me from leaving my home until 11 am. I used my ipod nike + to determine mileage. I went west past my daughter's school to Gila Springs subdivision. They have a nice dirt trail that leads north and thru another community past parks and homes. At the half way point I turned back east past my son's high school and back home. It turned out to be a bit over 8 miles total, but I was pretty tired at that point and was walking more than I wanted too. I finished at 1:45:53, a 13:07 pace. The weather was great. Maybe a bit to warm at 71 f. But, I was able to run in shorts and a tee. I'm sure a lot of you up north would love to do that in December. I frequent Runner's World website and converse with a lot of other runners from all over the country. My screen name is Meep Meep. Taken from the cartoon roadrunner. Anyway, I found this postcard at the Desert Botanical Gardens in Papago Park. 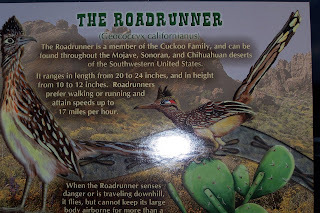 It says the roadrunner is from the Cuckoo family, which is kind of appropriate for me. The bottom paragraph says the "When the Roadrunner senses danger or is traveling downhill, it flies, but cannot keep its large body airborne for more than a few seconds". I know how he feels. I enjoy the anticipation that comes from knowing that I have a run to do later in the day. Throughout the day I will occasionally think about the run and where I am going to run and how far. There’s a feeling inside you that builds. It reminded me of when I played football in high school. On game days we’d wear our game jersey’s to class and everyone knew you were a football player and you had a game that night. Before the game we’d go into the cold musty locker room and sit on the bench in front of our locker. I’d open my locker and see my equipment just as I left it the day before. The shoulder pads taking the majority of space, sitting vertical because that’s the only way they’d fit in the locker at all. It was a ritual. I’d put on the pads the same way everytime and the anticipation would build. I’d help take the team through stretching drills, individual position drills and then we’d practice a few plays before we headed back in the locker for the coach’s pep talk. Finally, we played the game. Today, I remember the pregame stuff more than the games themselves. It was the anticipation of something important. And so it is with running too. I couldn’t run if I didn’t enjoy the anticipation, the run itself and the euphoria after I ran. I plan to run for the rest of my life. Some people say that they just want to do this one marathon and then they’ll stop and that they don’t really like running. I couldn’t do that. There’s not enough in a single event that makes it worthwhile. But, there is something about knowing that at the end of the year I will have run so many miles and I will have improved my stamina and health. And there’s something about the anticipation of my next run (whether it’s a race or just me). Sunday: 4 Miles in the neighborhood at a 12:09 pace. Time, 48:52. Tuesday: 2 miles in the neighborhood at a 12:20 pace. Time 24:41. I ran the first mile with my daughter Emily. We finished in 13:30. I got my copy of Runner's World. It's really good this month. In it is an article about Terry Fox, the Canadian who attempted to run across his country on one leg battling cancer. He is amazing. If you haven't read the article, buy a copy, go to the library or find a doctor's office that has Runner's World. You can also click on his name above to learn more. On September 17th of each year there are Terry Fox runs all across Canada. I can't believe there's not much going on here to honor Terry Fox. Today I ran. After 4 days rest from my vasectomy, I couldn't stand it any longer and I went out for any easy 2 miler. I had to put the garbage out at one of my vacant listings, so I ended up running on the canal that goes by this property. It's a part of the canal that is not landscaped for the public. Just a gravel drive for SRP trucks, but it worked for me. I ran at a 12:37 pace, which was faster than I thought I was running. It was just great to get out in the cold (54 F) and enjoy a run. The good news; I ran pain free. The Scale: I thought I would gain weight this week, since I wasn't running. I, actually lost about 1/2 pound and weigh 233.5 (a low for this year). These folks are my relatives, clients, fellow bloggers and mostly friends. These folks haven given generously to the Leukemia & Lymphoma Society. I, also, know that all of these fine folks have given to other worthwhile causes and are truly special people. Thanks again. I survived my minor surgery and feel much better today. Not good enough for a run, but better. I read somewhere, someone said that the name 'half marathon' wasn't appropriate for the race of 13.1 miles. That the name made it seem like it was a lesser race and that no other race 5k, 10k, marathon, ultramarathon had a name that made the race seem like a lesser alternative. So, I want to either hear a better name or come up with one that gives that race it's own identity. So help me out if you have a sugggestion. 21K - since that's close to the correct distance. I think 13.1 comes out to a bit less. A Sprintathon - Since most racers run the half a bit faster than they would a full. Even us, new to running would do the half quicker than half of a full. Sunday: rested most of the day. I did do a little work, showing a couple homes and taking pictures of two of my listings. In the evening, my daughter Emily ran a mile with me in just under 14 minutes. She's just starting out and doing great. Then I ran another 4.24 miles. My pace was around 12.52 for the entire run. I ran along the major streets (Ray, McClintock and Chandler Blvd.) for the first time. Since, I am doing longer runs, the neighbor hood is just not big enough anymore. One sad note, I passed a cat lying down off the sidewalk. It didn't move when I ran right past it (really close). I think someone lost a friend. Monday: I won't be running for the next few days. In about one hour I will make my way to the doctors office. There I will be getting minor surgery. Elective. Not a real big deal, but I will be getting a vasectomy. Not real smart doing this during training for a half marathon, but you gotta do it when the insurance will cover it. My first turkey trot. I think this should become a tradition. It had a start time of 9 am, so I got to sleep in just a bit longer. The course was around Red Mountain Park in east Mesa. 10 kilometers long, which is a first for me too. There was over 21oo runners, when I was expecting around 800. I was pretty impressed at seeing the sea of bobbing heads in front of me at the start. The weather was perfect, maybe in the high 60's and sunny. I got there in plenty of time to register and saw Maria and Hank, the TnT coaches. Since it was Thanksgiving Day morning I went out of my way to thank every cop on duty directing traffic as we ran. I, also, gave every kid a high five that wanted one. My plan was to run at a nice even pace for the first two kilometers (1.67 miles) and then take a walk break. After that I just took walk breaks as needed. I wanted to finish in 1 hour, 20 minutes or better. When I checked my nike+ (ipod) for pace time my running pace was at a 1:04 finish. I was fine with that since I knew that my walk breaks would add time. I was feeling fine throughout the entire race. At each mile there was someone yelling the overall time and I had my HRM and Ipod giving me time too. So, I was pretty happy, even though I don't have a way to keep my splits. I guess I'll have to memorize them in the future. This race I didn't talk with anyone. I just kept my nose to the grindstone and did my best. Which turned out to be better than expected. I finished in 1:10:53, a pace of 11:25. A time I am very happy with at this stage of my running. I did try to sprint the final 400 meters, but like the New Times race I started too soon and couldn't keep the pace. I think I need to wait until the last 200 meters or less. All in all, I was very happy with my first 10k event. Thanksgiving Day Dinner: Turkeys shake in their boots when they see my wife. She made a great dinner for my two kids, my father in law, mother in law and I. Turkey, stuffing, real mashed potatoes, real cranberry sauce, pumpkin pie and homemade whipped cream for the pie. A Lot to be Thankful About. As my family gets ready to celebrate Thanksgiving in the US, I'd like to thank all of you for visiting my blog, commenting and encouraging, allowing me to read you blog and supporting the Leukemia Society. My wife and two children. Life as I know it would not be nearly as rewarding and happy without these three wonderful people in my life. I do not know how I became so blessed. My parents, brother and sisters. They are always supportive and are always missed, since we live on opposite sides of the country. My wife's family. When I hear about other people's in laws, I always smile, because I know that I am blessed to have such wonderful people in my life. My Running. An acitivty that has given me focus to get healthier. Just 6 months ago I would have never dreamed about doing the things I have done in running and enjoying it so much. The Readers and contributers of my blog. I started this blog just for me to read to keep me motivated. I was willing to allow others to see my progress, but didn't realize the impact it would have. Now, with my blog and reading other runner's blogs I can keep my health as a priority in life. I have many more thanks in other areas of my life, but will just leave this list for running related thanks. 5 miles on the Arizona Canal. I started in Old Town Scottsdale and headed west just past the Arizona Falls. It was around 10 am and the temps were pushing 80 f. It was a beautiful day for a run. it took me about 1 hour 1 minute and 6 seconds to complete. I could have gone under an hour, but I had to water a bush along the way. Happy Thanksgiving to all who celebrate and peace to everyone. My legs felt pretty good today, after the 10 miles yesterday. So, I decided to run a mile and see how fast I could run it. My daughter ran with me to warm up. She is just starting to run, so we ran one minute intervals with a minute break in between. We did three of them around the block and I figure she and I can do this for the next week or so to get her into the habit of running. After we were done, I ran my mile. I started with a pace under 9:20, but soon realized I couldn't keep it up for a mile. I slowed to around a 10:30 pace and finished strong to run a 9:59 mile. I really wanted to get under 10. It was actually 1.01 miles according to my nike+. This is a Personal Best. Friday, I was supposed to run an evening 5k. The Gilbert Days race in Freestone Park. Instead, I had to work. Since, I am a Realtor and only make money when I sell something, work is good. I guess work comes before my running. So, no Gilbert Days run, but I made up for it with the 10 miler the next day thru their parade. Football Note: The Buckeyes and the Bengals won. Oh yes! Heck, even the Arizona Cardinals won. This has been a great weekend. Blogger note: I'm curious where people that read my blog are from. I read blogs from over 15 states, Ireland, Italy, Japan, Austrilia and Michigan. I heard someone say that Michigan is part of the US, but I don't believe them. So, if you're reading this please let me know where on this planet your from. Today is the day I wanted to do double digits. 10 miles on the Consolidated Canal. I slept in, so I didn't run with TnT. Just myself at 8 in the morning. I parked at the New Gilbert Center. It is a wonderful place of shops, restaurants and a theatre. My plan was to run south for 2.5 miles or 5 miles round trip. The canal is closed at Chandler Blvd., so I didn't have much choice anyway. This way at the half way point I could stop at my car if needed and resupply. I ended up stopping at the gas station for a bathroom break. The Gilbert Days Parade was going to be happening soon, so I crossed the street to continue my run as Parade watchers were starting to line the street. I headed north to do my other 5 miles. About 1.5 miles up the canal I ran out of gatorade and decided to turn around and resupply at my car. I figured at my car I would have 8 miles in and then I could just do the final two miles on the southern portion with drinks. I did eat a vanilla gu which I think I like the best. As I returned to the corner with the parade, the streets were lined with people and the parade was in full stride. It's a parade to celebarate Gilberts early days, so there were lots of horses, cowboys, floats, etc. Very southwest. Ahh, but there was abreak between floats and I needed to cross the street. So, I just kept on running and ran down the street for about 200 feet. I was in the parade at this point. Finally, a few people started clapping for me. "Don't look Ethel", no I wasn't streaking, but I wasn't supposed to be in the parade. It was fun. According to my Nike+ I was running at a 8:30 pace too. I finished my 10 miles on the south side by myself in a time of 2 hours 11 minutes and 11 seconds. A Personal Best for time and distance. Next year, I just might run the entire Gilbert Days Parade. Football note: I'm from Ohio and today is a big day. I wore my OSU 2002 National Championship Tee today and one runner did say "Go Bucks" as I passed. It should be a great game today with the team from up north (Woody Hayes would never say the state name). It's a great rivalry and both schools have benefited from it greatly. It'll be great to see the scarlet and grey up against the maize and blue again. And maybe, God willing both teams will meet again in Arizona for the national championship in January. So let me tell you about two of my birthday presents. One is a Polar Heart Rate Monitor. You wear a belt around your chest that reads the beats of your heart and a watch that gives you the data. When I'm running I really don't notice the belt, so I do like it. I'm surprised that my heart rate is as high as it gets. I'm usually in the 140's to the mid 150's, but I peak out around 170. It gives me my heart rate at any given time and at the end of the run it gives me the high and average HR and how many calories I burned. But, it does not give me lap time or splits. So, I did what any body would do. I bought myself a present. It's a Nike Plus for the Ipod. Here's the way it works. I place a sensor in my shoe and a receiver on my Ipod nano. I calibrate it for my running gate and it tells me when I go a mile, what my time and pace is. And it does this while I listen to my favorite tunes. I can get feedback at any point in my run and it will tell me at each mile or kilometer how I'm doing. Then I can download the info to a website and get even more info. Now, you're supposed to have nike shoes that have a special place to put the sensor. The girl at 'The Finish Line' told me I had to use Nike's. But, I took my New Balances and cut into the mesh, inserted the sensor and tied it closed. It works beautifully. Here's a photo of my Ipod gear. So, my first run with the Nike Plus was the New Times 5k. I didn't calibrate it before the race, so it was off a bit. The second run with the new gear was a 3 miler, in which, I calibrated the sensor. It worked like a charm. I ran it at a 12:07 pace. The third run was the TnT Track workout tonight. I ran 3.56 miles in a little over 51 minutes. That included the walking time inbetween each 5 minute run. Movie Time: "You're never too old to go to space camp." The family went to see Stranger Than Fiction, the new movie with Wil Ferrell. This one is well worth seeing. You can get graphs like this here. Click on the graph to enlarge. 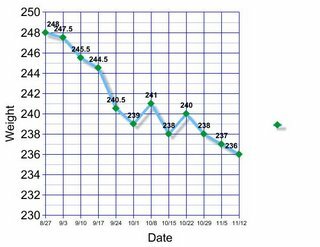 If you'd like to see a more complete history of my weight lose, you can click on the link to the side of this called: pounds lost. My Favorite Blogs: Down along the side of my blog are links to my favorite blogs. I just added Jenny from southern Wisconsin. Her and her husband have done a tremendous job dieting and running and I thought I would share it with the world. Well, at least with that part of the world that visits my blog. So, I finish around 8:19 am in the morning and had to wait til 7:37 pm to get the chip time. Pretty quick since it was the same day, but it seemed like a long time to me. I thought my time would be above 34:30. It was the first race I ran that used a chip. For those that aren't familiar with chip timing, it works like this. Since everyone can't cross the starting line at the same time, you wear a radio chip that will time you from start to finish. So, even if you pass the finish line at 34:50, it will adjust your time. I must have started nearly 50 seconds behind the leaders. In longer races it will give you split times too. My line is above. I finished in 529th place out of 704 runners in the 5k race. The next number is my bib number, then M for male, 45 for age, 34:00 is my official chip time and a Personal Record. 10:57 is my pace per mile. I don't have a clue on the other number. Then my city and state. I do like to finish strong. I turned the corner onto Mill Avenue (downtown Tempe) and started running as fast as I could. I passed many, but ran out of gas before I got to the finish line. I managed to keep running and luckily no one passed me. Six people finished within 10 seconds of me. I'm pretty sure I passed them just past the corner. I started the race with Javamom. She started running in July of this year and is doing fantastic. We ran together past the first kilometer. After awhile I went on. She finished in 36:51, a great time for her first race. I have to remember not to let little kids take pictures for me. At least, if I want my entire head in the photo. More race report to come. Here's a neat graph. 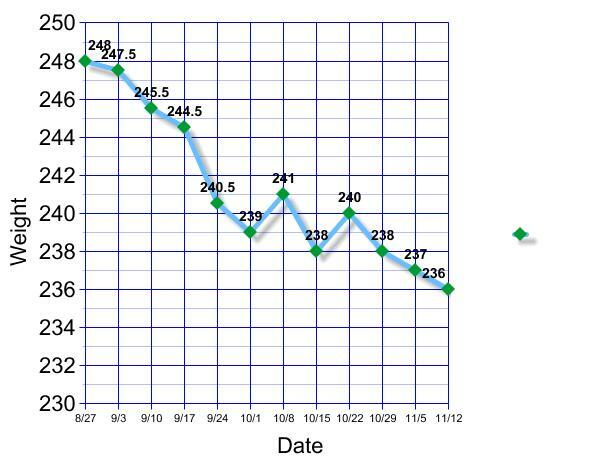 It shows each of my workouts and races graphed at what my weight was on that day. I've run two races and I was 10 pounds lighter on the second run. Consequently, I ran the second race almost 8 minutes faster. Does this mean, if I lose another 40 pounds I'll finish a 5k before I even start? Last night I ran with Team in Training (The Luekemia Society) at the Andersen Junior High Track. We ran 6 sets of 5 minute runs with a two minute break in between. I estimate I ran about 3 miles. It was a good workout and a chance to meet some of my teammates. I'm getting pretty excited about running the New Times 5K this Sunday. It will be the first big race for me. I'll get to run over the Tempe Bridge, Tempe Lake and around downtown Tempe and the ASU Campus. My report to follow. Yes, back in 1961 I was born on this day. Did you know that if you look at 1961 upside down it's still 1961. See I typed them upside down. So to celebrate I ran the Western Canal in the morning. 2.5 miles each way up to the Ken McDoanld Golf Course and the power plant. It was a slow run, 1 hour, 7 minutes and 20 seconds, but a good one. I passed a half dozen walkers, a few bikers and I found a golf ball. A Wilson Ultra Competition 90 compression golf ball. During the run, I tried to think of when I played golf last. I can't remember. Given the choice, I'd rather run. Now to do a bit of work and then Amy and I will go out to lunch somewhere. Just before the one mile mark you come up to the I-10 bridge. You leave downtown Phoenix and turn onto McDowell. Mariscos is just one of many restaurants along McDowell. Not sure, other than shrimp, what they serve. Some say this building looks like a roll on deodarant. Maybe it is, since it is the Dial Building. Not sure if Dial still has it's corporate headquarters here, but runners will see all the tall (tall for Arizona) skyscrapers along Central avenue. Banner Good Samaritan Hospital. Between miles 3-4, but I doubt any runners will be ready for the emergency room. The Hohokam Indians built canals all around the valley of the sun and then disappeared. But, the canals are still hear serving the Phoenix Metropolitain area. There also great to run, bike or hike around. Team in Training runs the Arizona Canal every Saturday morning. Once a month all the TnT groups meet there to run. Today was the day. This is about one mile west of Granada Park or I-51. Today we did 7.6 miles. I did my run in 1:41:30, the longest run, time wise, for me. There's underpasses to get you away from traffic and entrances like this one at each major road. And sometimes shade. But, heck this is Arizona. We don't have much shade. I passed 200 miles for the year, for my life. It was just yesterday that I was really excited about passing 100 miles. OK, maybe I need bigger milestones. Can't wait to pass 500 miles. The other milestone was I set a PB for 1 mile. 10:48 on the track at Andersen JH. I set out to see if I could do a 10 minute mile. My first 1/4 was 2:25 followed by 2:35, 2:48 and 2:59. I'm still pretty happy with this PB. Of course, the downside is I felt tired the rest of the run. Since I was running on the track, I lost count of the laps and just ran when I wanted to and walked when I wanted to. All in all, it was a fine night. Get your very own emergency info tag to place on your shoes, fanny pack or shorts. If you're ever in any accident, they'll know who to call, what your name is and what your allergies and blood type are. This is on a Finish Line Preferred Customer Card, so you'll also get discounts from the Finish Line. If you purchase $200 worth of items from the finish line in one year, you'll get a $20 gift card too. And while supplies last, you'll get a $10 gift certificate with your shoe ID. All you have to do is make a $5 donation online to support my running and the Leukemia and Lymphoma Society. You'll get two (2) ID tags, a Finish Line Preferred Customer Card and (while supplies last) a $10 gift certificate to The Finish Line. So, since I didn't do a long run over the weekend, I thought I would do one on Monday night. My previous long run was 7.2 miles. On Monday I did 8 solid miles in One hour, 41 minutes and 9 seconds. 1:41:09. I was happy that my splits were pretty close together. PF Chang's RNR 1/2 Marathon: One of the benefits to doing a race in your town is that you can go over the course. Today I drove from downtown Phoenix to the finish on the campus of Arizona State University. Over the next few months I will share some pictures of the course. The view from the start line. This is in downtown Phoenix, just east of the Capitol and Wesley Bolin Plaza. Not the most scenic part of Arizona. The 1/2 marathon course goes from rough urban city to picturesque Papago Park and Tempe at the end. Just past the start is the Forensic Science Building. Reminds me of the TV show "Bones"
Almost directly across the street is 704 W. Jefferson st. Interesting building, I wonder about it's history. All this and we've haven't gone by the one mile marker yet. More pictures of the 1/2 marathon course to follow. The full marathon is 98% different. It was a beautiful morning in Tempe, Arizona. Perfect day for a 5k road race. This was the second official race I've participated in. The other one was at this same park, Kiwanis Park just 2 months ago. I knew my time would improve, but I wasn't sure by how much. I was hoping to finish in under 37 minutes, beating my first run by 5 minutes. There were less runners out for this race. Maybe 80 runners total and some walkers, strollers, etc too. I paced myself pretty well and watched as most of the runners faded from my view. One, lady that recieved a medal for her age group would leap frog me everytime I took a walk break. I don't believe she ever walked. Finally around a mile and a half I passed her. When I would walk, I would hear a runner approach and that was my signal to start running again. I think I took about 5 walk breaks for about 30 seconds to 1 minute in duration each. In the last half mile I didn't see anyone in front that I could catch. I believe I finished about 2 minutes behind the runner ahead of me. But, I didn't want to be caught either. There were about 3-4 runners within 20 seconds of me. At the end of the course you run around the lake and then up a short hill. Then it's about a quarter mile to the finish on the soccer field. I decided that I needed to put some distance between me and anyone else at the hill. So, I charged up the hill and kept a steady pace to the finish. The announcer noticed me checking behind for runners as I neared the finish, said over the loudspeaker that there was no one there and that I was finishing strong. I liked that. I finished in approximately 34:35. 2 1/2 minutes faster than I was hoping for and way faster than I ever thought I would. Almost 8 minutes faster than my time on the same course 2 months previous. I am overjoyed. I still can't believe it. After the race, I hung around the finish and high fived runners as they came in and took my picture crossing the finish. Yes, it's a fake finish photo. I then watched the kiddie dash and met some neighbors who were giving out raisin bread from Safeway Markets. They had on halloween costumes, the kind with rubber old people's faces with big noses, so I didn't recognize them, but they said, "arn't you Emily's dad?" More people know my daughter than me. Wow, I still can't believe my time. I remember back in June when I ran for the first time. I made it about 10 houses before I was out of breath. Look, they have my time a bit better and I was one place from a medal. But, I finished 10 minutes behind the third place finisher. Softball News: We lost our tournament game. It was terrible. We ended up playing on a different field that was smaller than the one we usually play on. The bases were the same, but the fences in left were about 65 feet shorter. We don't really have to many power hitters, so the advantage went to the other team. They hit three balls off me that would have been catchable on the other field. Here, they ended up on the other side of the fence. We were toast. But, we had fun and look forward to playing again after the holidays. The past couple days have been humid. At least as far as AZ goes. 60% compared to 20-30% that I am more used to. Because of this, my running times haven't been so hot. Four miles in 53:53 on Monday and 54:23 on Tuesday. At first I was dissappointed with my Monday time. Searching for a reason, I came up with the humid weather. Could this be the reason why I gained a bit of weight too? So, chime in and give me some 'words of wisdom'. Which is harder to run in, higher tempatures or higher humidity? Does higher humidity cause your body to retain water and therefore add to your weight? I'll have to do some research, but I would like to hear from anyone with an opinion. Miles Run: You'll notice on the right hand side there's a couple new features from RunningAHEAD.com. My year to date, weekly and lifetime miles, as well as, my last 8 runs. I have been touched by the generosity of those donating to the Leukemia Society. We've gotten over 15 donations from 9 different states for over $1100. My goal is $1700 and I'm giving $400, so all I really need is another $300. I would like to see a donation from every state. Any amount would be appreciated, even $1. So, if you don't see your state on the list, consider giving. Cardinals $50 (Mike & Karen Perry) - Detroit Tigers $0.00. the Chicago Marathon is over for this year. I was looking at various runners and I noticed someone from my hometown with my last name. I don't think I'm related to him, but you never know. I wouldn't mind being related to him, because he's fast. Congratulations to all that did their best in Chicago. Friday: Softball nite. We lost a heartbreaker 9-7. Saturday: Morning run with TnT. 4.6 miles of hills in South Mountain Park. 55.37 in 60 degree weather. It was beautiful. I looked at Monday and Wednesdays workout and noticed that the third mile always took way longer than any of the other miles, including the fourth. Why? I remeasured my course and found I was going another 1/10 of a mile in mile three. At a 12 minute pace, thats over one minute more running. Makes sense. So on Thursday I ran the new measurement and shaved 30 seconds of my last time. Running in South Mountain Park is beautiful. Desert running on the park road. We ran uphill for the first 2.3 miles and then retraced our steps back to the parking lot. The weather was just barely 60* at 6:30 am. There was two groups running, so when we started it was like a race with over 100 runners. TnT had two groups. The full marathoners went for a short 8 miler. The rest of us went for a four miler. My goal was to get back to the parking lot before any of the 8 milers did. Some of them are twice as fast as I am, so I thought it would be a great incentive. I made it to the half way point, 2.3 miles in about 28 minutes. The approximate elevation at this point is 1608 feet. We started at 1350, so we climbed 258 feet. It was a bit of a struggle up for this first time hiller. Downhill was a breeze. I took a one minute break at the top to drink some gatorade and a one minute bathroom break about half way down and made it to the parking lot in 27.5 minutes. A total time of 55.37, that I am happy with. Here's the route. you won’t like the other one. Saturday: 3 miles in 39.10. Heavy rains at 6:30 am. Granada Park/ Canal - Phoenix. Monday: 4 miles in 48.54. 9 pm. 70*. splits: 11.54/11.40/13.27/11.51. PR for 4 miles. Saturday was the first practice with TnT. There was about 50 runners. As soon as we started, so did the rain. It rained pretty good the entire time on I was on the canal. After the run we heard short talks from Scottsdale Running Company on picking the right shoes to run in, a chiroprator and massage therapist. Monday evening, Tyler and I went to the Phoenix Rock Gym. His Adventure Crew (a branch of the boy scouts) goes there to climb the walls often. I climbed about 4 times. Making it to the top twice. Afterwards, I ran my 4 mile route in record time. I kept busy by counting the Saguaros. There are 18 of them on my run. Softball Report: Our church team is really coming around. Last week we won 14-13, scoring 3 runs in the last inning. Tonight we won 22-2. That's right 22-2. That makes us 2-4 with one game left before the playoffs. I had two good hits. Both went to the fence on a couple hops. Someday, I'm gonna hit one over the fence. Someday. Baltimore Marathon: Tomorrow is the big day in Baltimore. Hopefully, the weather will cooperate and everyone will have a great run. Katie, one of my donors for the Leukemia Society is running a half marathon. Go Katie! Team In Training (TnT) update: We've gotten 15 donations to date. From Arizona, Ohio, Indiana, Maryland, California, Illinois & Wisconsin. Only 43 states to go. If you'd like to donate, please click on "support my running" at the top left of this page or right here. Oh yeah. Today's a rest day. Tomorrow morning I train with TnT at Granada Park. What a great run tonight. I usually take walk breaks when I run (no, walking isn't cheating). Usually, it's whenever I feel I need one. Which means the first one is too late and the rest are too often. Tonights plan was to take two per mile for just a minute each. The first one was at the corner of Florence and Ross, the 2nd one at the corner of Lisbon and Genoa, the 3rd one at the corner of Drake and Monterey and the last one at the corner of Monterey and Harrison. That would finish my two mile loop and then I would do it all over again. It all went as planned the first two miles and I ended up setting a personal record (PR) for the first mile of 11 minutes even and tieing a PR for two miles at 23:17. My third mile was at 12.49 and the fourth at 14.33 for another PR for four miles at 50:42. I finished with standing knee deep in my now cold pool for 10 minutes. I guess you could say that's an Arizona Ice bath. Wildlife in our community: I run in a very residential neighborhood. We don't have woods anywhere near us, but we do have a neighborhood skunk. I saw it last night, but it was no where to be found tonight. Poor thing. We have pretty sturdy garbage cans, so I don't know what it's gonna eat. Maybe it's someone's pet. I hear they can take away it's stink glands (I don't know what the glands are called). Tomorrow's a cross training day. That's what I call playing softball with the gang. Then on Saturday I have practice with Team in Training (TnT). Chicago Runners: Althought I'm not running in the upcoming marathon, I hope the weather gets better. I saw snow in Chicago today. Isn't it funny when you become a runner, you start watching the marathons like it was Super Bowl Sunday. Good luck in the Marathon. versus where you want to be. So I guess I should recap where I've been. In my first post I talked about being able to run just a few houses before I was gasping for breath. But, that day I became a runner. On August 13th, I ran 3 miles in 47 minutes and I made a note in my journal that it was the "Best Run Yet!" On September 2nd I ran in my first organized race, "Run for Brooke" and I ran 3.1 miles (5K) in 42.17, a 13.38 pace. Last night I went for a 4 mile run at a 13 minute pace in 52 minutes flat. I used to think that 3 miles was a long run, but now 4 miles is just a typical run and anything under 3 miles is a short run. I'm hoping that when my 45th birthday comes around in November that 4 and 5 mile runs will be short one's and I will be doing double digits for my long runs. A few years ago I got the itch to play softball again. I rounded up a bunch of guys and we had a team. Most of us didn't know each other. I was the coach. It just happened that I assembled a pretty good bunch of guys. We all had different occupations, lived in different parts of the city and most probably would have never of met. Patrick Sullivan was one of the players. In his early 40's, he loved softball and his family would come out to watch us play. He was a lefty with a lot of power. We'd like it when he'd hit those line drives into right field. He'd pitch for us, play some outfield and even played short for us. It was a little challenging for a lefty, but he would pull it off more times than not. Yesterday, he died from cancer. He's been fighting it for the past year. I guess he held on until his beloved Padres finished their season. Of course, lately he has not been able to play the game he loved. Now, I guess he's leading off and playing short for some team up above. God Bless you, Patrick Sullivan. Today's the day for the bi weekly weigh in. I know I want to see slow steady improvement, which is what I am seeing, but it would be nice to see a big drop in weight, inches, etc. My weight today is 242. It's been as low as 239.5. My low weight is always listed on the left hand bar. Click on the number for historical stats. You can also click on the labels - "tipping the scales" to see all posts relating to my weight. Yes, these posts are somewhat painful. Hopefully, someone that is losing weight too will find it motivating. I guess I should add this paragraph, because the post so far sounds somewhat depressing. I have losts 15 pounds so far and about 2 inches off my waist. I have gone from being able to run 1/10 of a mile to running 2 miles straight and I can run/walk over 7 miles. I am very happy with my progress to date. Since I haven't run since Friday due to the turn around trip to Magic Mountain, I decided to do my long run on Monday. I did the same 2 mile loop in my neighborhood 3 1/2 times. I officially went 7.2 miles in 1:39:45. That's the furthest I've gone to date. It's also the longest time I've been on my feet. The half marathon will be 13.1 miles and I will probably be on my feet from 2.5 to 3 hours. A typical training program will have one day a week in which runners will stretch out their mileage. It's called a Long Slow Day (LSD). The strategy is to run slowly for a longer distance. Usually 10% longer than you ran last week. Then a few weeks before the marathon you tapper or reduce your mileage to rest up for the big day. I would like to do a couple 13+ milers before Christmas. My knees are aching this morning. Whenever, I stretch out my distance I usually ache a bit more than usual. Today is no different. But, I'm not hurt. They say the rest days are when your muscles are growing. Today will be a rest day. NRR (Not running related): Magic Mountain was great. I got to ride some of the roller coasters with the kids, but since I was there as a caperone, I also spent some time doing smaller rides and games with the kids that were not into doing every roller coaster imaginable. The food was less than good. So, I didn't hurt my diet any and I did do a lot of walking too. The bus ride was pretty quite. But, sleeping on a bus is difficult none the less. We managed. Emily, my daughter had a great time, as did, all of her friends. Fund Raiser: The fund raiser for the Leukemia Society is going great. Everyone has been very generous, but I still need more donations. In my attempt to get a donation from every state, I have gotten four states. Katie (a fellow blogger) gave $5 from Maryland. I don't know Katie personally, but she had done a wonderful job with her running and diet. If you want to see some amazing before and after pix, go see her site. She's also great with advice. I, have also gotten a donation Jerry Sappingtoon from California. Not sure how he found my blog, but I do appreciate it. If you don't know, I am trying to get donations from all fifty states. I am, also trying to get a total of $1700 in donations for the Luekemia Society. To date we have $411. My wife, Amy has been wonderful in helping to get funds. I may be running, but she is diffently helping big time. Tonight, after the softball game I will be leaving for Magic Mountain in California with my daughter. It's, what Arizonian's call, a turn around trip. This is where a bunch of teenagers and their guard dogs (that would be me) get on a bus at midnight. We drive to the park, just in time to enter. We play all day and then get on the bus again to drive back to Arizona. Of course, we sleep on the bus. At least that's what they told me when I volunteered to be a chaperone. Therefore, I won't be running today or tomorrow. I got a 4 mile run in last night with a bit of an upset stomach. I was thinking about running in the "Race for the Cure" Sunday morning. Since we don't get back from Magic Mountain until late Sunday morning, I will probably skip it this time around. Additional edit: I did have some time before the softball game to get in a mile. Fellow blogger, Vic just ran a one mile race and was pumped about it, so I decided to do just a mile before the game. My time was 11:31. 21 seconds slower than my personal record (PR) and 24 seconds slower than Vic. I like running the mile for time and will continue to do so in the future. I remember making it a mile without stopping, then a mile and a half. Tonight it was two miles without stopping and I owe it all to my father, mother and Junebug. I read a blog about this lady in Houston that has been running for a little over a year and is planning on running the Houston 1/2 marathon. She said she is making a list of people for each mile she's going to run. I assume that means that she's going to think about these people for an entire mile. So, tonight I thought about my father during mile 1 and my mother for mile 2. There they are in front of the Alamo. I guess this would be a better story if the lady from Houston was from San Antonio. But, she's not. Anyway these are my parents. I'm their fourth, last and best (?) kid. My dad was stationed in Japan during the Korean war. His parents told him to bring them something back from Japan. So, he brought a wife and kid. They raised us four kids in College Hill, a great little neighborhood on the northside of Cincinnati. My dad, the army cook worked as a restaurant manager for 40 plus years. Many years with either my mom or one of us kids working along side. So, that's what I thought about tonight. I ran splits of 11.42, 12.46,14.54 and 15.58. OK, so that first two miles kind of wore me out. It was still a good run. I do need to mention one more thing. I'm losing lots of weight, but my son made a comment and I think he needs to get grounded for it. I told him the street light go out a lot just as I'm running under them at night. He said it was probably due to the vibrations. Yes, I'm big, but I'm not that big. One small step for a man, and I'm out of breath. So, September is over and I logged in a bit over 80 miles. That in it self is a giant leap! Since August 1 I have logged 135.42 miles. Most of them in my neighborhood and my neighbors are starting to wonder about me. I've decided to clear off all the junk that's on top of my exercise bench in the garage. I got a great deal on it, but lately it's just been a place to store tools, paint brushes and the like. Now it will be my home between runs. I was running almost every day, but they say the rest day is when your legs rebuild stronger. So now, I'll run every other day. Weight lift in between. On the 30th, I did 4 miles in my neighborhood in 54:58. Splits of 12:13, 13:50, 14:42 and 14:11. On the 1st of October I did an upper body work out. Yesterday the 2nd i ran 4 miles in 52:05. A 13 minute pace. If you want to see my daily mileage look on the left bar at the bottom, you can click on the mileage total anytime or here. How's the donations coming? California and Maryland are in the lead. I'm looking to get donations from every state. It's still early, but you can Donate Here. So now I'm a member of Team in Training, The Leukemia & Lymphoma Society. I'm going to raise money to eliminate blood cancers. Please consider supporting me in this attempt at running my first 1/2 marathon at the PF Chang's Rock and Roll Marathon in Phoenix. To date I have run 6.2 miles. It took me 1 hour and 27 minutes. Can I run 13.1 miles? I believe I can and would like you to support me by donating to The Luekemia & Lymphoma Society. I would like to get at least a $5 donation from every state and a total of $1700. Normally, 25% of this amount would go toward my training, entrance fees and a really cool purple running shirt. However, I will be donating $425 to pay for my fees. All of your donations will go to the society. How Slowwww can I go? Tonights workout was to see how long I could run and how slow. I've heard lots of runners say to slow it down to be able to run further. To date I have run up to 1.5 miles without stopping. But, then I was spent and I couldn't run for 3 minutes at a time after. Or I would run 5 / walk 1 or 2 and I could do that for 3,4 or 5 miles. My times were always better when I would do the 5/1 plan. Tonight I ran 3 miles in 41.29. Splits of 13.07/14.27/13.55. What I was most proud of was the fact that I ran the first mile without stopping. I then walked for about 1:20. Then I ran the rest of the mile in about 13 minutes. I was spent. I thought I was done. I couldn't even get inside my house. I sat down on a ledge in front of my house. It was nice and cool and I felt better after 10 minutes. And I was happy that I ran 26 of the first 27:20. So, I ran some more. I did my third mile in 13.55. I ran 2/3 of the mile. It was a great nite for running. I guess it's official. I am going to be running in my first 1/2 marathon on January 14, 2007. Our local PF Chang's Rock and Roll marathon with very little elevation change. From downtown Phoenix to downtown Tempe. I attended the Leukemia & Lymphoma Society's Team In Training (TnT) meeting tonight and decided I should run for a cause. They have a coaching staff that will train us for the next 3 months and we runners will raise money to help find a cure for blood cancers. If you're a runner and are planning a 1/2 or full marathon, I would encourage you to run for a cause. After the meeting I still needed to get my 4 miles in. I ran a new course in my neighborhood. It's 2 miles long and I ran it twice. My splits were: 12.25/14.45/16.12/13.51 for a total of 57.13. Not real good, but it was back up towards 88* at 8 pm at night. That gives me over 127 miles since August 1. I came across this website and found it interesting. FaithFul Souls. Then I went to their blog of the week and really liked it. I'll put it with the other blogs I have on the left hand bar. The plan was to take my son to his archery tournament and run Papago Park in the morning. Archery tournaments are fun for the archers, but not so much for the spectators. Even when your son or daughter is shooting, you can only watch so much. Of course, if you’re into proper form and winning the tournament, then you might spend all day coaching your kid. My kid was more than happy to let me run and shoot in peace. So off I went on my morning run. It was in the high 70’s by 10 am, a good day for a run. Papago park is divided by McDowell Road. On the north side is the archery range, softball fields and the Oakland A’s spring training practice fields. On the south side is the Phoenix Municipal, the game field for the A’s, the zoo, botanical gardens, golf courses and picnic areas. I started out on the north side, which used to be a POW camp. During World War II, we would house many German POW’s at this site. Imagine Hogan’s Heroes with Nazi prisoners in 110 degree desert. These soldiers most have thought they went to hell. But, it probably beat being on the front lines of a war back in Europe. This part of the park is pretty flat. Lots of trails going every which way for mountain bikers, hikers and trail runners and lots of rocks. Pretty easy to turn an ankle, so I went even slower than I would normally. While I ran I remembered a story about the POW’s. At one point the prisoners decided to dig a tunnel under the fencing to the canal. They would then float down to the Salt River (Rio Salado), steal a boat and cruise on down to the Colorado and then to Mexico. There, they could find a way to get back to Europe and help in the war. They actually did tunnel to the canal and floated down to the river. What they didn’t realize is that most rivers in Arizona are dry. There were no boats to steal and no water to navigate. All of them eventually ended back at the camp. Some of them had to ask to be allowed back in the very next day. A half mile into the run I crossed McDowell road to get to the old amphitheater. With lots of energy I raced up the steps to the top and ran around the butte to get to the southern portion of Papago Park. Here there’s a closed asphalt road that slowing goes downhill to the golf course. A nice easy run, as I passed hikers, strollers, other runners heading back up and a guy on a skate board. Hard work going up, but he was having a great time going down. Galvin Parkway divides the park into west and east sides. I needed to cross here to get to the zoo, my ultimate destination 1.7 miles from the archery range. It was still early enough that I could run on the exit side of the drive since not very many people were leaving the zoo. I made it to the zoo entrance, a bridge that goes over one of the park lakes. In the lake are a lot of turtles. The like to swim up to the logs and climb on. Soon too many turtles are on and the log rolls spilling all the occupants back into the water and the show starts again. I took a breather watching the turtles, went inside the zoo for a quick bathroom break and bought a soft serve ice cream cone. Then, I turned around and retraced my steps back to the archery range. It took me about 21 minutes to get down to the zoo and 25 minutes to return uphill. I wasn’t concerned with time, I was having too much fun taking pictures and enjoying the trip. If you haven’t done a desert run, I highly recommend it. Just do it when it’s cooler. Here’s some pictures of my run at Papago Park. Thursday: 6.2 Miles. My longest run to date. 5 1/2 miles were by myself at a good pace of 12.49. I walked with Amy (dw) after mile 1 for about 7/10ths of a mile. My splits were: 11.06 PR/11.43/11.57/13.45/13.55/8.03 (1/2 mile) . I ran this in my neighborhood. My usual track - Sun Rise Loop. Friday: 1.4 miles in Kiwanis Park. From the ballfields around the lake and back. I ran it all in about 18 minutes. Guessing on time, because I forgot to stop my time when I was done. I ran it after our softball game. We lost, but had a good time. I hit a two run homer. I, also, pitched. The ump called more illegally high pitches than I've had call on me in the last 12 months. I do like to pitch high. Hopefully, he won't be umping many of our games. Saturday: 3.5 miles in about 46 minutes. Ran from archery range in Papago Park to the zoo and back. 21 minutes downhill and 25 minutes back up. My son particpated in the "Shut Up and Shoot" archery tournament put on by Arizona State University's Archery Club. While he shot, I ran from the range, across McDowell Road to the zoo. It is all part of Papago Park on the Tempe, Scottsdale, Phoenix border. The course was 1.7 miles downhill to the zoo and 1.7 miles uphill back. It was also the first time I ran off road on a trail. Desert trails have lots of rocks. I had to run around a butte, in a wash and up to a closed road (asphalt) to get to the zoo. At the zoo I crossed over the bridge that has a lake below with lots of turtles. I needed to use the facilities and the zoo was nice enough to let me go in without paying. I felt obliged to at least buy a soft serve ice cream. I watched the turtles a little bit more (there on the outside) and then ran back to the archery range. I took some pictures of my run. No coffee tonite and I still ran great. My first mile was at 11:10, a PR. The second mile was in 12:07 for a total of 23:17, a PR. Then I ran a 13:02, a 14:40 and a 13:38 for a 5 mile PR of 1:04:37. Denise with her blog, A Thinner Women Inside, mentioned a website called RunningAHEAD. It's pretty cool place to log your miles, chart running loops and even see the elevation. It uses google maps, like many websites do so that you can see the map or satellite image. You can map out your course and you can see the elevation. I'll try to get some photos or graphs up about it soon. As for now. . . I added the graph for miles run per day on the left hand bar down near the bottom. Here's the charts for weekly, monthly, yearly and lifetime miles run. Ok, so my daughter won a coffee maker. A Senseo. You see she listens to the Gilmour Girls Podcast. They had a contest to make a t-shirt and she won. A coffee maker. Of course, none of us drink coffee. I read somewhere that caffiene will help you run better. So, an hour before I ran I drank 4 oz. of coffee. The result - a PR of 35:52 for 3 miles, a PR of 23:40 for the first 2 miles and a PR for the 3 mile pace of 11:57. Was it the coffee or the lower temperatures? I'm not sure, but I will be trying a cup of Joe more often. So, what do you think? Is it the coffee? What do you do to get better results? I kind of feel like Barry Bonds. I am reading a lot of books lately about running. So, I thought I would give a report or review about each book I read. Instead of mixing them in with my daily reports, I made another blog. If you look on the left column under links, you'll see Pat's Running Book Reports. Click there or here and you'll see my reports. I quickly did three of them. I will add more later and update these when I get a chance. If you'd like to volunteer a book report, email it to me at pat@RealtySecrets.net and I'll add it to the reports. I made it to 100 miles today. I ran in the middle of the day in 90* weather. The Arizona Sun was blazing and I wore sun glasses for the first time on a run. I should have worn a hat. It was hotter than I am used to. I ran two miles. My first mile was in 11:25, just 4 seconds of my PR. The second mile was in 15.35. Not so good. I changed my name on Runner's World's forums. I was No Fries. Not sure why I picked that, but I did. I asked for suggestions from othr forumites and I got several pretty good ones. RunITout, AZdoesIT and several others which were great. But, the one everyone liked the best was from TeamKT. The said, "you live in a state that actually has road runners, you should be meep meep." After the Roadrunner cartoon. They don't know that I run more like a desert tortoise. Maybe I should call myself "road kill". It took someone from outside the state to think of that. Us, AZ residents don't immediately think of the Roadrunner cartoon when thinking about our state. Plus, we don't have road runners running down our streets. We have pidgeons and roof rats. We have dust devils and huge dust storms more than we have rain. We have really hot weather in the summer and wonderful winter weather. Some of us have scorpions, some of us see rattlesnakes or javalina. But heck, I live in the city and all I see are stray cats and lizzards. So, I got my first 100 miles in. Now for the next 100 miles. That should be around October 19th. I will probably celebarate by running that mile somewhere new. I could run it on a track and try to set a PR for the mile. I could run it 200 miles from home. Maybe in some national park. I sure could use some suggestions. Click on the comment and give me an idea. It was softball nite. We usually lose, but tonight we played our hearts out. we were down, but came back and had a chance to win in the last inning until I came to bat. I live for the chance to get the game winning hit in the last inning. You don't get the chance often. In the game I got a double in the first scoring a couple and I walked twice without getting anything to hit. The final at bat went to a 3-2 count and I didn't want to walk. A got a lousy pitch way outside and I swung. And missed. Game over. We lost. In co-ed softball when you walk a male, he gets to go to second. We would have scored a run and had men on 2nd and 3rd with two outs. When you walk a male with two outs the women following can also take a walk. We would have had bases load, down by 1 with Duane up. He would have gotten a hit, I'm sure and we would have had a great chance to win. As you can imagine, I feel bad. After the game I ran 5 laps around the two softball fields. That's two miles. Then I did five 50 yard sprints. It felt good. Life goes on. Sorry guys. Since I started recording my mileage in early August I have ran/walked 96 miles. So, on Saturday I should reach the 100 mile mark. That's like running from my home to Tucson. Almost to the intersection of Ajo Way and I-10. That's where you can find the Tucson Electric Park, the spring home of the Diamondbacks and White Sox. the past two nights I have run 4 miles each to reach 16 for the week. I plan to run 2 after the softball game tonite and 4 more on Saturday. That will give me 22 for a personal high. Wednesday was particularly satisfying. I woke up with my left knee hurting a bit. But, it had hurt the last couple days. Nothing major, just a dull pain from adding mileage. But, I also woke up with my right ankle hurting. I don't know how this happened. I must have slept on it wrong. Anyway, I it hurt all day. I didn't think I would run. Since I worked at home most of the day, I didn't have shoes on. Later in the afternoon, I finally put my shoes on and the ankle was supported and didn't feel so bad. I decided to try the run at night and after about 1/4 mile, I didn't feel any pain in either place. It was a great run and I haven't had any pain since. OK. So I'm visiting Bookman's in Mesa, a wonderful place to buy used books, cd's, magazines and video games. I want to buy some older issues of running magazines. They have a July, 2006 issue of TrailRunner. I buy it and take it home and notice that my name is on the cover. "Rockin n' Runnin' with Train lead Singer Pat Monahan. It's kind of cool to have the same name as someone who's famous. Anyway, it's a great article about Pat being into trail running. He says he runs 5-6 times a week on trails if the weather is good. If not, on treadmills, but never pavement. Hey, if you're looking for stuff about the singer, please let me know by posting a comment. Single Family Homes or Townhomes & Condos. 8/30/2006: 248 lbs, Waist: 46 1/2", Hips: 46", Chest: 47", Rt thigh: 26 3/4", Neck: 18 1/2"
So, I'm down 2 lbs. But, on September 9th I weighed 243.5. My waist is down 1.5 inches, my chest is down 1.25 inches, thigh down .25". But, my hips are up. Could it be normal fluctuations or my wife, Amy not measuring in the same spot. Maybe I tucked my glutes in last time. Either way I'm not worried about short term numbers, just the overall numbers. I'm not out of breath when I stop. My legs just say enough. The last mile I was doing a fast run (for me) of about 50 yards and then walking for about 15 seconds. I guess you could call it intervals. I wonder if I should do intervals the entire time. Slow jog, medium effort, slow jog, medium effort, ect. If anyone's reading this, give me your opinion. Another Interesting Website: Running for Fitness is a British website that will calculate how many calories you need to burn or eat, how much over or under weight you might be, your BMI, how much faster you'd be at a lighter weight and other interesting calculations.